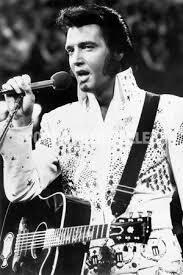 Elvis was taken from us in 1997 – far too young at the age of only 42. He lives on in our memories and on our airwaves as the undisputed King of Rock’n’Roll. His voice, talent, looks and charisma have ensured the massive stardom he achieved while he was alive has only increased since his death – his stature as one of the true greats is assured for many, many years to come. Rather than talk about Elvis’s achievements and his talent, we decided to be shallow and talk about his looks and his style instead! 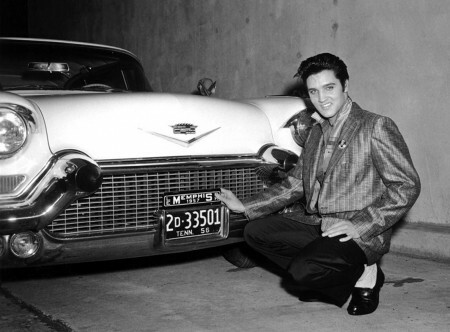 Just as Marilyn was a trendsetter, so too was Elvis – he was the first of the rockers to make “bad boy” style cool and sparked the quintissential Rockabilly-style. Q1. What do you think of this style … look familiar ? A. 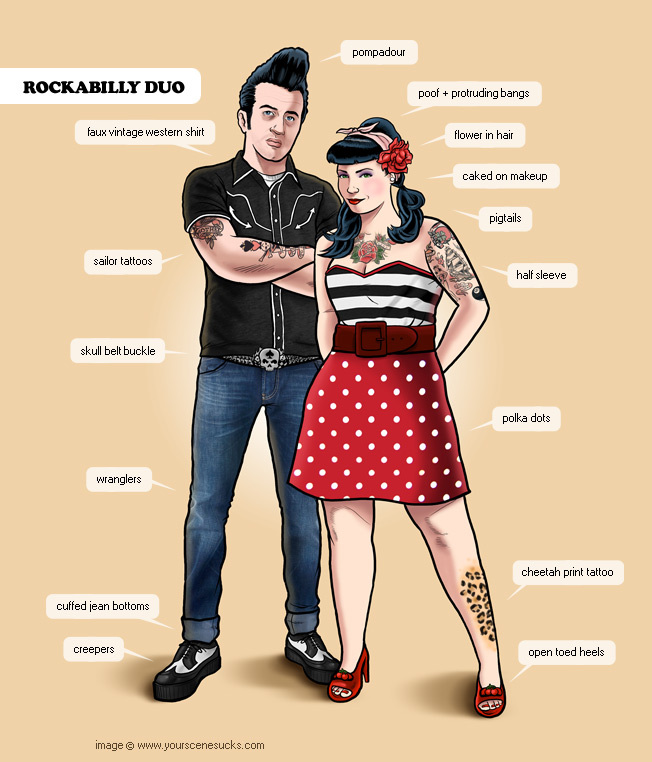 It looks very familiar and I love it Mumpty – Rockabilly style at its finest. My sources tell me the Rockabilly look has undergone quite a resurgence in recent years and I’m pleased to hear that – it was a good look the first time round. The only thing I’d like to point out is that I preferred not to wear denim. 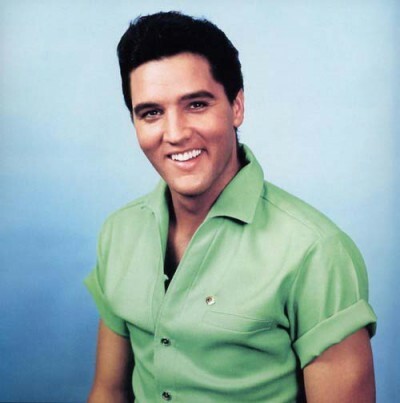 Fun fact # 1: Elvis didn’t really like wearing denim – it reminded him of his less than fortunate upbringing. Q2. 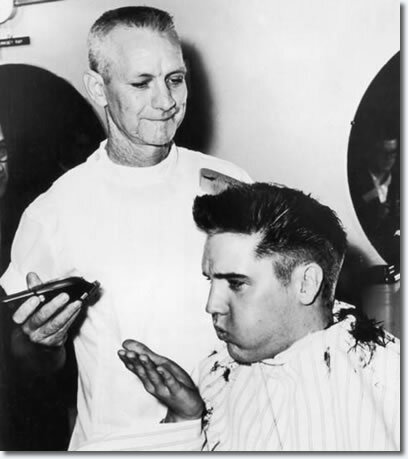 The “Elvis pompadour” is now iconic. Can you tell us what products you used. A. First off … did you know my hair wasn’t naturally black? It was sandy blonde, but I liked it edgier – blue black – so I had it dyed. I was pretty lucky I had my own personal hairstylist – Larry Geller – he used to dye my hair for me every two or three weeks – I think the product he used was L’oreal. I told him “you can do whatever you want with my hair, just make sure I don’t lose it.” I basically just used pomade and a comb to get it how I wanted it. Then hairspray – lots of hairspray. It used to flop quite a bit though when I was performing ‘cos of the lights and moving around so much. 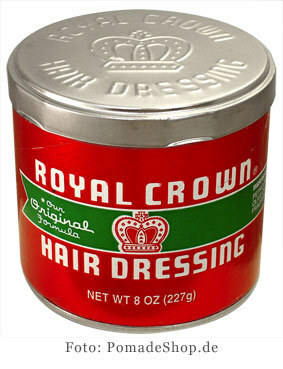 Note: Elvis’s personal hairstylist has said he used Royal Crown Hair Dressing pomade on Elvis’s hair, which gave it that wet, shiny look. It only had three ingredients; petrolatum (petroleum jelly), olive oil and fragrance – fancy stuff! You can still get this pomade and they’ve never deviated from their original recipe – I guess if something ain’t broke, don’t fix it right?! Q.3 Elvis, tell us how were you feeling when this picture was taken? A. Well, it was too late at that stage anyway ma’am – it was already done! Just before the cut though, I was pretty apprehensive to be honest – my hair was a big part of my look. But I was going into uniform anyway, so that wasn’t really a problem as my “look” was going to be the same as all the other guys. In general though, I was pretty nervous about the whole two-year military stint but I wanted to do what I could for my country and not to take advantage of my position, so I did it. Note: this image of Elvis’s defiantly-cool hair being reduced to Army standard instantly became a pop culture phenomenon. Prior to the “big chop” thousands of teenaged girls (and older women too I’d guess!) wrote to the president trying to avert the “national crisis” of Elvis’s haircut! Q4. 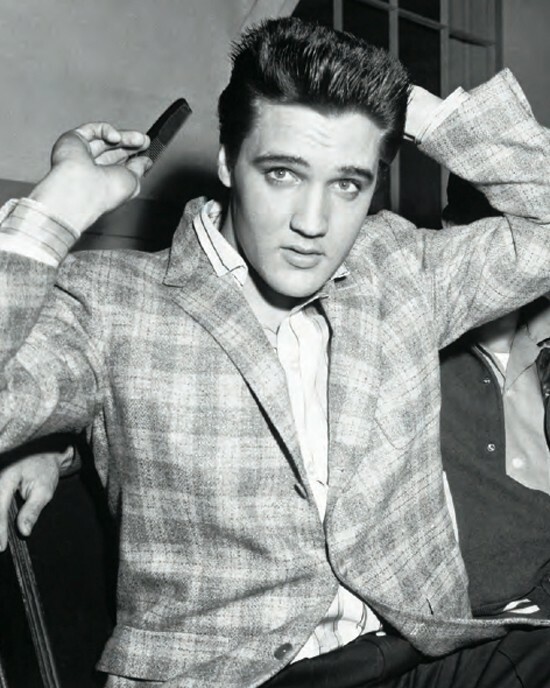 Elvis, did you see yourself as a trendsetter in terms of fashion? A. No ma’am …at first it would amaze me when I’d wear something and then suddenly it was “street style” around the world – it was pretty surreal. After a while though I started to play with it a bit and I’d wear increasingly outrageous stuff – just to see what people made of it. I guess I had access to whatever I wanted in many ways when it came to fashion – and being a showman – I took advantage of that. I loved tailor-made suits, hand-made shirts and I liked to wear pink – which, at the time, was not the done thing. I was big on leather jackets too – I had hundreds of them – in all colours – I never shied away from colour. I also never forgot the power of a simple white shirt, (which, if I’m honest, suited me better when I was younger!) although I did like clashing prints and textured fabrics too. As you know, in my later years, I wasn’t adverse to a bit of lycra and lamé either … in fact I was wearing it long before P Diddy sent it down the runway – just sayin’! Note: A letter, sent in 1956, from Elvis’ costume suppliers, had a pencil note on it, indicating Elvis’s measurements at the time were: chest – 40″, waist – 32″ and he wore size 10 shoes. Q5. Can you tell us the story behind the infamous blue suede shoes? A. Yes ma’am, I can. That particular song was inspired by Johnny Cash – we were out together one night and Johnny told Carl (Perkins) about a guy he’d met when serving in the military – this guy had referred to his military regulation airmen’s shoes as his “blue suede shoes.” Johnny wanted Carl to write a song about it but Carl said he couldn’t write about something he knew nothing about. Anyway – later that year Carl was watching a couple dance and he heard the guy tell the girl “uh uh – don’t step on my suedes.” That night he set it to a nursery rhyme “one for the money” and the rest is history I guess. 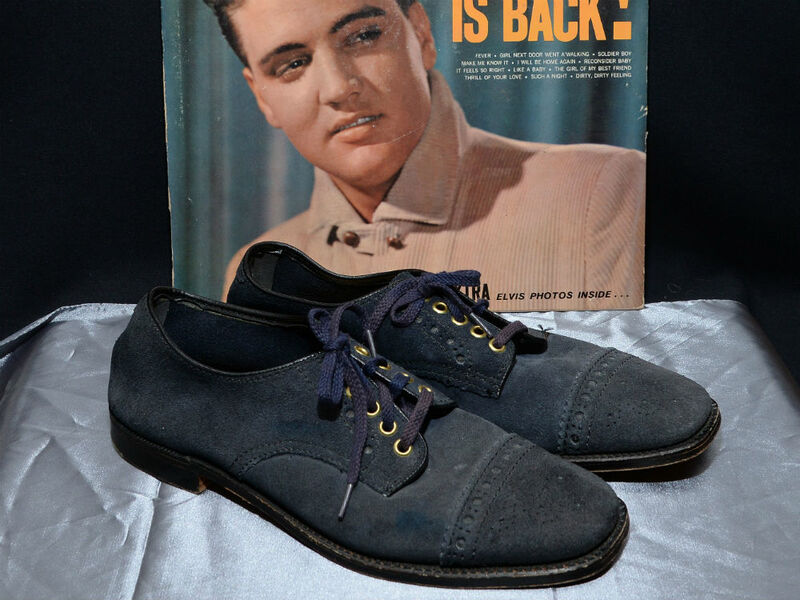 Fun fact # 2 – In 2013, the only pair of blue suede shoes owned by Elvis were sold for £48,000. Q6. What would you say was your most outrageous period in terms of what you wore? A. Aaaah … definitely when I started working with Bill Belew – he designed the jumpsuits and capes I wore – it was a lot of fun. He was big on embellishment and I enjoyed wearing all that flashy stuff. Especially the big collars – I really liked those. Fun fact # 3 – there are around 250,000 working Elvis impersonators around the world! Fun fact # 4 Elvis had a great sense of humour – listen to this live performance which was being taped, where he ended up laughing hysterically mid-song! Fun fact # 5 Elvis’s backing singer in the above video was Cissy Houston – Whitney’s mother. Her professionalism in carrying on right the way through his antics made him laugh even more! What made Elvis laugh the most though was that after he’d changed the words to “do you look at your bald head and wish you had hair”, he noticed a man in the audience had taken off his wig and was waving it at him! 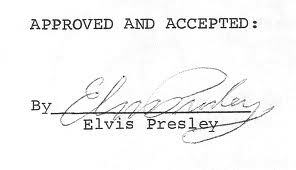 And on that rather hilarious, and oh-my-God hot, note – Elvis and I will sign off. Thanks Elvis – it’s been fantastic talking to you. PS: Elvis has left the website. Posted on October 6, 2014 November 25, 2014 by MumptyStylePosted in Mumpty Fiction, Mumpty Q&ATagged Elvis Presley, fashion, mumptystyle.